Providers like Avera Health are revamping their digital tools to better engage consumers. 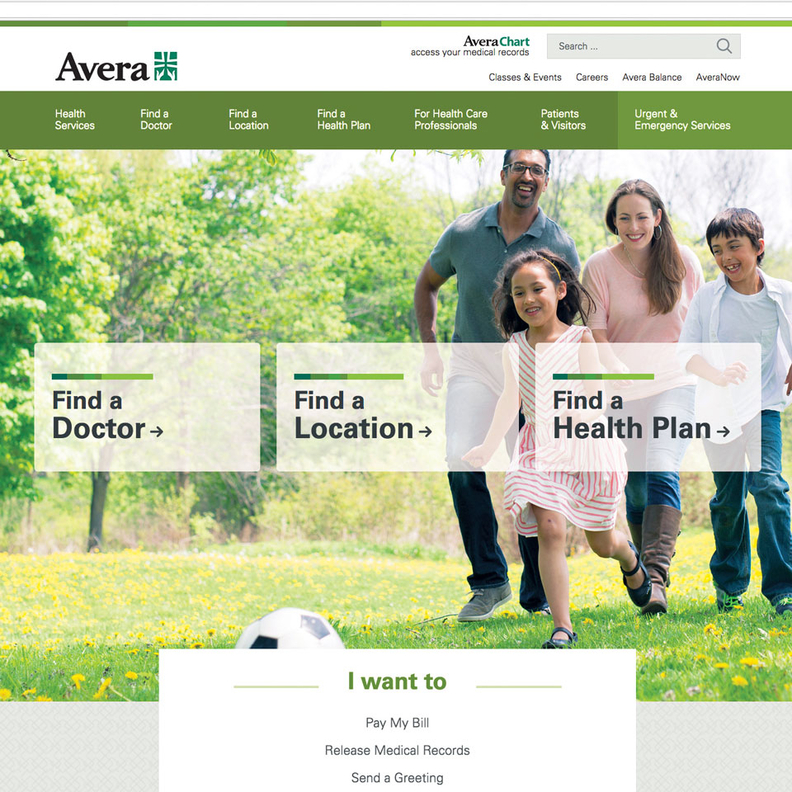 Avera sought to create a patient-centered website as it pared down nearly 9,000 webpages across the brand. Healthcare organizations that fail to embrace new ways of engaging consumers risk becoming the next Blockbuster or Borders. As a result, many providers are borrowing ideas from other industries as they seek to build more consumer loyalty. To a certain degree, it starts with understanding what consumers experience when they first interact with an organization. Sit in the waiting room or try to navigate the company's website to book an appointment in order to understand how the experience can be improved, Suzanne Hendery, chief marketing officer at Renown Health, told attendees at Modern Healthcare's Strategic Marketing Conference, held Nov. 7 in Chicago. "Our role as a CMO is to wake up and smell the coffee—we are not as good as we think we are," Hendery said. "If we don't start fixing some of these problems, they will keep multiplying." Hospitals and health systems have put a premium on capturing the attention of prospective patients. Marketers have scaled their digital campaigns, especially on mobile platforms, as they look to increase access, particularly as deals like the proposed CVS Health takeover of Aetna and Amazon's foray into healthcare have put them on notice. "The CVS-Aetna deal is being driven by Amazon entering the PBM space. What is next?" said Ramon Soto, chief marketing and communications officer at Northwell Health. "If we don't own the customer relationship, then we do it at our own peril." Once they get patients through the door, providers have invested in keeping patients happy, which is a main tenet of the industry's move toward value. They have tested strategies to see what resonates, including same-day appointments, journey mapping the patient experience, exploring telemedicine and slimming down websites while rethinking content strategies to improve search engine visibility. Providers can better understand patients by cleaning and organizing data so it's actionable and interoperable, increasing price transparency and sifting through Google searches. For too long marketing has focused on getting placement in various publications, said Suzanne Sawyer, chief marketing officer at Penn Medicine, the University of Pennsylvania's health system. "We have to step back and see that the root word of marketing is 'market,' " she said. "We need to partner with clinical operations to inform product development and site selection to make sure it's not 'build it and they will come' business development." When Walgreens partnered with Advocate Health Care in Illinois to provide clinics at their retail stores, it brought instant credibility, said David Barber, division vice president at Walgreens. A simple call from a pharmacist to follow up on a patient's first insulin injection can build the foundation for a long-term relationship, he added. A team approach can improve patient engagement, Hendery said, adding that when physicians have benchmarking data, they are often best-suited to improve the customer experience. To boost patient engagement, providers are also exploring tools like wayfinding apps that help patients navigate hospitals, digital tools that automate follow-up texts after procedures, bill paying, and appointment reminders, partnering with Uber or Lyft to get patients to appointments, and explaining charges and deciphering benefits. While cost is an important dynamic in the patient experience, many providers have yet to make significant progress in becoming more transparent on prices. But certain companies like Avera Health have had some success. Avera recently rolled out a genetic test that has helped attract and retain patients, said Lindsey Meyers, vice president of public relations. Patients can get their blood drawn for the test, which helps identify how patients respond to certain medicines, with a primary-care physician for under $300. "You are the last bastion of trust because people trust their providers," said Eric Langshur, CEO of Consultancy Avia and managing partner at Abundant Venture Partners. "Leverage that relationship you have and convert it and integrate it with your workflow."